At 19th Avenue Dental, we utilize all-ceramic crowns, also known as porcelain crowns. 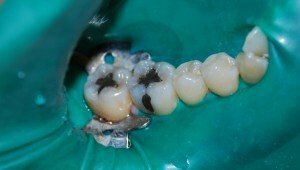 There are many advantages to using porcelain crowns. We are able to match the color of your porcelain crown to your natural smile for a confident aesthetic. Porcelain crowns are also easy to design, create, and place with our advanced CEREC® technology. After removing a thin layer of tooth enamel, we use molds to custom make each porcelain crown. During your follow-up appointment, the crown is then permanently cemented into place, allowing you to eat, drink, and speak as normal. If you are interested in learning more about our long-lasting, all-ceramic crowns, please contact our dental office today. We would be glad to schedule your appointment and answer any questions you may have.